The steps to Upgrade to the latest version are very similar to the installation. 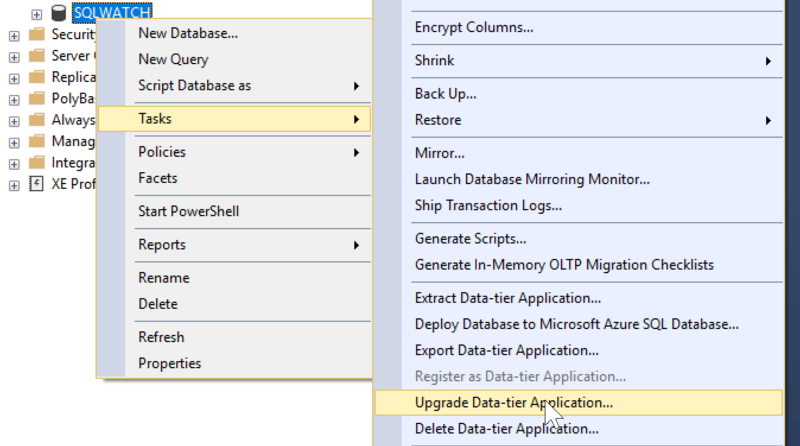 The only difference is when you use SSMS you will have to right-click SQLWATCH database and run Upgrade Data-Tier Application instead of Deploy. This is because database deployments from DACPAC or Visual Studio are handled by SqlPackage.exe and are delta based. This means that only the changes required to bring the database to the desired state (latest state) will be deployed. In case of a brand new installation the delta will include all objects and in the case of an upgrade, the delta will involve only objects that differ between your version and our latest version. It does not matter what your version is! The above approach also applies in case of dbatools. To update SQLWATCH all we have to do is to re-run the Install-DbaSqlWatch as in the installation step.